Speaking from my own religious experience, the occasional, personal knowing of God, in itself, does not confer staying power and retrieval of that ecstasy. The memories wear away with time. However, the practice of the Revelation of God in the presence of a Realized Master confers depth of insight and Divine Transmission beyond one’s own limited capacity. This is the practice that makes consequential the age-old belief in help from higher realms. Thank you for this labor of love! A recent Gallup poll reported that 86% of all American adults believed in God. "Belief in God" is the primary way many of us describe our relationship to the Greater Reality. But why settle for believing in God, or even for some "spiritual experiences" now and then, when the tangible, ego-melting, suffering-dissolving Revelation of Real God, pervading, washing, and dissolving "you" again and again (through a lifetime of Spiritual practice), would utterly transform your life, and fulfill your heart's otherwise unendingly unfulfilled desire for perfect happiness? 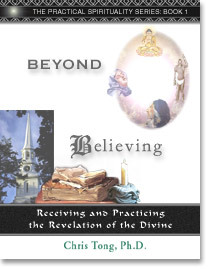 The intention of this book is to help restore true religion, "re-ligio", the lifetime practice of genuinely "re-connecting" with God moment to moment, which necessarily depends on a steady, unrelenting and very potent source of Divine Revelation. The result of such steady and genuine practice is Spiritual Realization, the fundamental and permanent shift in one's sense of (and conclusions about) Reality and self, in which God is completely and tangibly obvious in every moment as Divine Presence and ultimately Realized as our True Self. 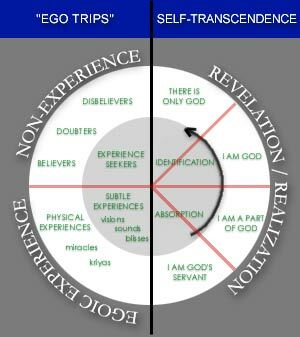 You need not spend your entire life in the "non-experience" quadrant, shuffling between belief in God, disbelief in God, or uncertainty about God.